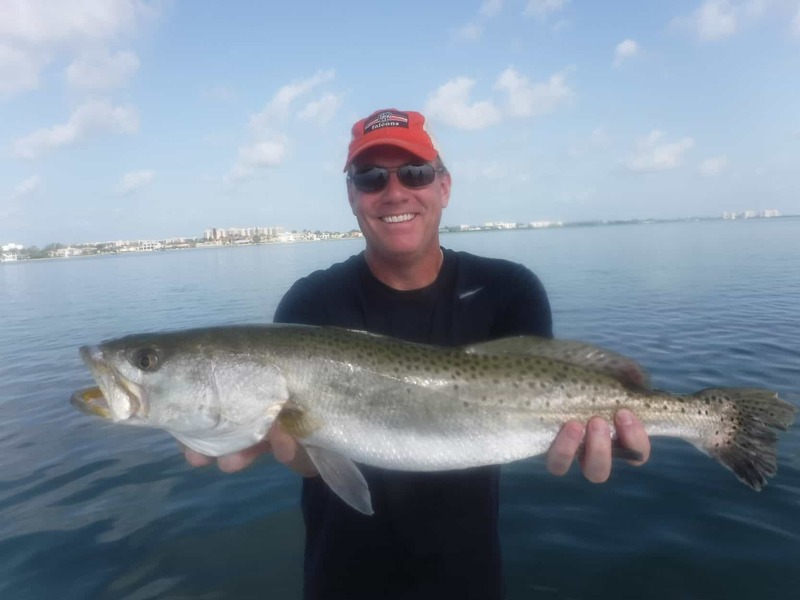 Sarasota speckled trout fishing is extremely popular. Speckled trout are arguably the most popular it saltwater inshore game fish in Florida. This is really true for the entire Gulf Coast. 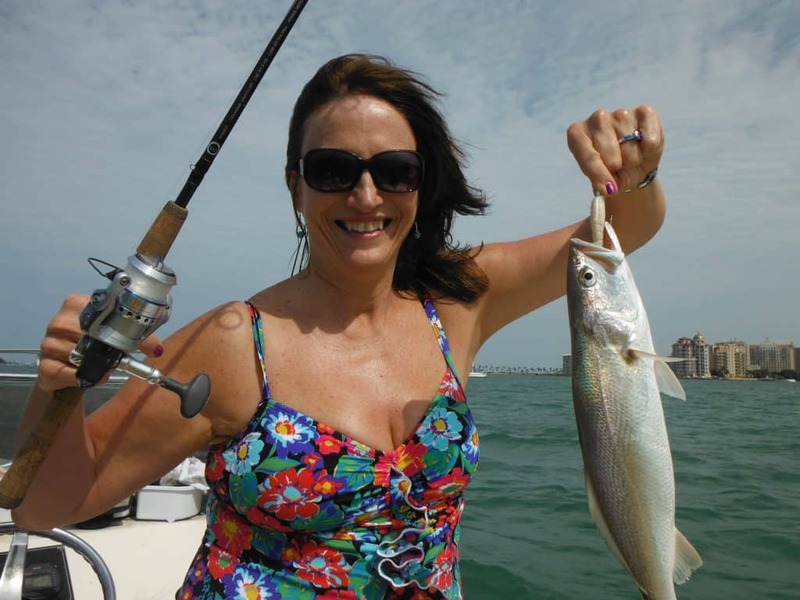 An article on trout fishing follows my weekly Sarasota fishing report. Angling success this week required me to keep moving on my Sarasota fishing charters. Red tide has crept into Sarasota Bay. The key to catching fish is to find “good” water. The best water and spots this week were Bishop’s Pt., Buttonwood, Long Bar, and Stephen’s Pt. Speckled trout and ladyfish were fairly plentiful. Several times we ran across schools of jack crevelle foraging on the surface. This is very exciting! These fish are very aggressive and hit lures with gusto. Bluefish were mixed in with them as well. A few decent mangrove snapper were caught, too. The wind eased up late in the week and we were able to find schools of “breaking” fish. Clean water up in north Sarasota Bay had the fish bunched up pretty good. Ladyfish and jacks were plentiful, with bluefish, Spanish mackerel, trout, and snapper mixed in. Unfortunately, the red tide has been working north in Sarasota Bay. I cancelled my Friday trip as the wind shifted west. It was breezy and I did not think conditions would be good. The odor was not nice, either. Jigs and free lined live shrimp produced best this week. A Gulp Shrimp on a 1/4 ounce jig head produced well. Live shrimp on a #1 hook and a small split shot was effective as well. Live shrimp can be small this time of year. We call it “pee wee season”. However, they did get a little better this week. One strategy that can be effective during red tide outbreaks is to fish “different” areas. Fish will move out of their normal seasonal spots in search of water free of red tide. This can push then into unconventional spots. I don’t normally fish docks in canals and creeks this time of year. However, we found success in Bowlees Creek up north, catching snapper, black drum, catfish, and other species bottom fishing with shrimp. There are several reasons for the popularity of speckled trout. They are a beautiful fish. Speckled trout are abundant and available to coastal anglers throughout the state. Trout are aggressive, taking live bait, artificial lures, and flies. Lastly, they are fantastic table fare. What more could an angler ask for? Most of the Sarasota speckled trout fishing is done on submerged grass beds in Sarasota Bay. A few trout are caught in the surf, in the passes, and near structure. However, the vast majority are found on grass flats in between four and ten feet of water. Some of the largest trout will be caught in very shallow water. These “gator” trout are normally loners and not in schools. Speckled trout can be caught using several different tactics and many different baits. This is one of the things that speckled trout so attractive to anglers. The oldest and still one of the most productive techniques is a live shrimp under a popping cork. This is a “system” that works very well on trout as well as other species on the grass flats. 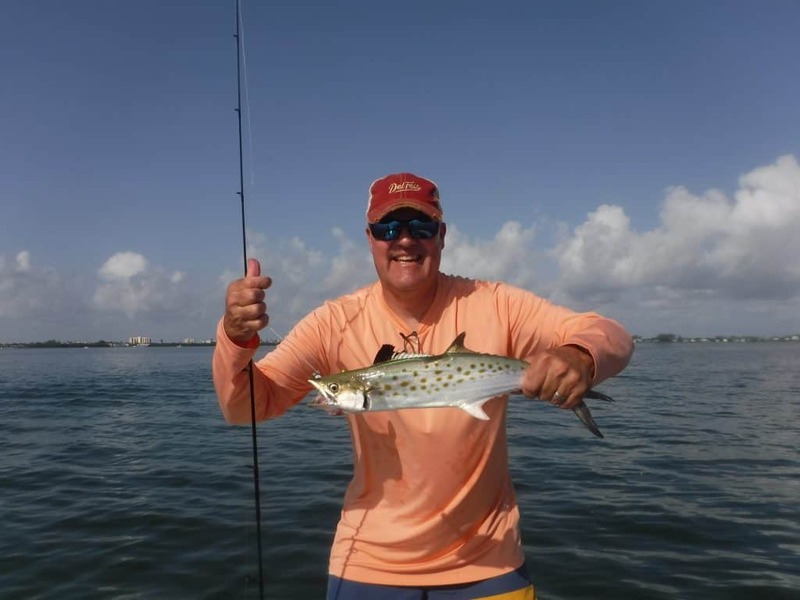 Spinning tackle is the choice of most anglers fishing the inshore flats for speckled trout. A 6 ½ foot to 7 foot rod with a 3000 series reel is a versatile outfit. Ten pound monofilament line works well. Anglers who prefer braided line will do well with 20 lb braid. A 24” shock leader of 25lb to 30lb test finishes off the basic tackle. The rig consists of a #1/0 live bait hook, 24” of 30 lb leader, and a noisy float or “cork”. These floats have a weight at the bottom and a concave top. It sits upright in the water and when the rod tip is sharply twitched, the cork “pops” in the water. This noise attracts fish as it imitates fish feeding on the surface. The depth can be adjusted, but generally three feet is a good depth. Anglers cast the rig out with a live shrimp hooked in the head under the horn. It is allowed to settle and then the cork is “popped”. The shrimp will rise up in the water then settle back down. Often times the bite occurs right after the cork is popped. When a fish pulls the cork under, the slack is eliminated and the hook is set. The process is repeated several times, then reeled in and cast back out. Live bait fish such as pinfish and grunts can be used under a float as well. While difficult to obtain, there is no better bait for a nice speckled trout that a 3” grunt. Pilchards and threadfin herring can also be used. One new twist is to fish an artificial shrimp under a noisy cork. This works quite well! Artificial lures are very effective for anglers Sarasota speckled trout fishing. The most popular lure is a lead head jig with some type of soft plastic body. ¼ ounce is a very good choice for a jig head. Most often, anglers will be fishing in six feet to eight feet of water. A ¼ ounce jig casts well and will get down in the water column. Grub bodies come in all shapes, colors, and sizes. #3” to 4” baits work best in Sarasota Bay. That size matches the existing forage nicely. Shad tails have a great built in action and imitate bait fish nicely. Paddle tails and shrimp tails mimic shrimp, a favorite trout food. Color really is not all that important in most cases. The old saying “light colors in light water and dark colors in dark water” is a good guideline. White, pearl, glow, chartreuse, pink, olive, gold, rootbeer, and golden bream are all productive colors. On days when the bite is tough, switching to scented soft plastic baits will sometimes get the bite going. The most effective scented soft plastic bait in this area are the Gulp line of baits. The 3” Gulp Shrimp has fooled many speckled trout on the west coast of Florida. It also works great fished under a cork with a 1/16 ounce jig head. Plugs work well for speckled trout, too. Topwater plugs will catch large trout fished over bars and potholes on the high tide. First thing in the morning is the best time. MirrOlure makes several suspending plugs that have been catching trout for many years. The 52M series and Mirrodines work great. 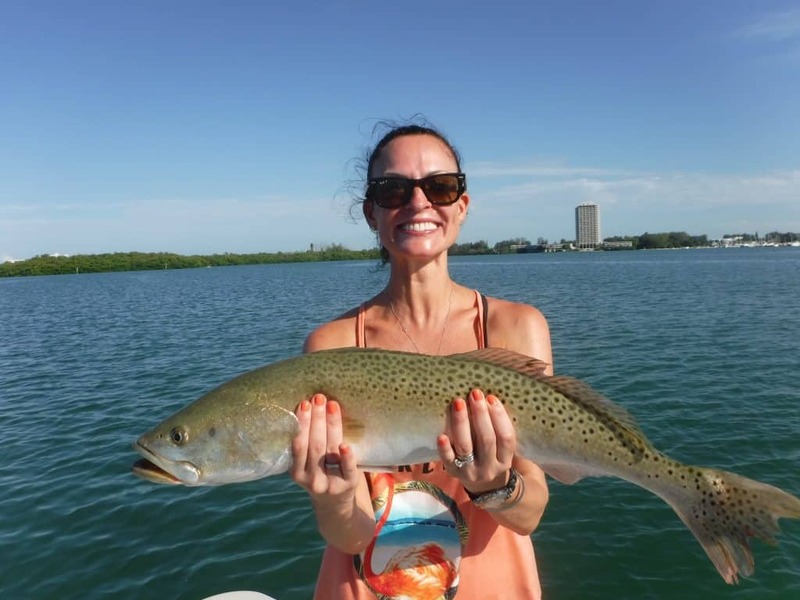 Fly anglers are certainly not to be left out when it comes to Sarasota speckled trout fishing. Many speckled trout are fooled by skilled fly casters. The best out fit is a 7wt to 9wt rod with an intermediate sink tip line. A 9′ leader that tapers down to 20 lb tippet works fine. The most popular fly choice is the Clouser Minnow. Is is a weighted fly that actually fishes like a jig. Chartreuse and white is a proven color pattern. Speckled trout spend a lot of their lives loosely schooled over deep grass flats. Therefore, drifting the flats while fan casting out in front of the boat is an extremely effective technique. The best approach is to choose a flat where the wind and tide are moving in the same direction. This will facilitate a good drift. Once some action is found, anglers have a choice. They can either continue continue the drift and then when the action slows motor around and drift again. Another approach is to quietly anchor the boat and thoroughly work the area with either lures or live bait. One extremely productive technique is to chum with live bait. This works very well in the summer when bait is abundant and east to catch. A LOT of bait is required for this. Specialized equipment such as a cast net and the ability to toss it, a large well, and high volume pump are also needed. Once the well is loaded up (“blacked out” as we call it) the boat in anchored in six feet of water or so. Anglers will do well to position the boat on the up-tide end of a good flat. Live bait fish are then tossed out behind the boat. Several baits are hooked up and cast out into the chum. If the trout and other game fish are around, it won’t take them long to show up. The chum will get them fired up and feeding. The best flats in Sarasota Bay are from Siesta Key north. Bird Key, Radio Tower, Middlegrounds, Stephen’s Pt., Bishop’s Pt., Buttonwood, and Long Bar are the top spots. In the summer, the flats near the passes are usually the best spots to fish. Strong tidal flow and abundant bait fish as forage are a couple of reasons for this. The area south, from Siesta Drive to Blackburn Pt. Does hold speckled trout. However, the character is I bit different. Grass beds are not at all plentiful. Most fish relate to oyster bars and mangrove shorelines. This area won’t produce the numbers of the north bay, but it will reward patient anglers with some quality fish. Some of the largest speckled trout will be caught in very shallow water. This seems like a contradiction, but it makes sense. Large fish do not need the safety of numbers. They also are less afraid of birds. Finally, large trout feed primarily on large baits such as pinfish, grunts, and mullet. They prefer one large meal versus a bunch of shrimp. Shallow water trout fishing is very tide specific. Trout will position themselves on the edges of plats and in holes on the lower tide stages. As the water rises, they will fan out on the flats, scatter out, and feed. As the tide falls, trout will set up in likely ambush points. Bars that drop off, holes, and channels that run through flats are prime examples. Tactics are a bit different in this “skinny” water. Topwater plugs are a good choice. They imitate a perfect sized mullet and will not hang up in the grass. Soft plastic baits used in conjunction with a weedless swim bait hook works well getting through the grass. If the grass is sparse or the tide high, a 1/8 ounce jig head with a 4” shad tail bait is a good choice. Weedless spoons will also produce in shallow water without hanging up. Speckled trout will move off of the flats in the winter if the water temperature drops into the mid 50’s. They will move to deeper holes, most of which are man made “dredge” holes. The same goes for channels cutting through a flat or near the edge. Trout will school up in the deeper, warmer water. A jig bounced slowly off the bottom will catch these deep water trout. The fish will be a bit less active, so a more subtle presentation will usually be more productive. Live shrimp free lined with a split shot are seldom refused. It takes a bit of prospecting, but once a large school of trout is found, the action can be frantic. Another productive winter Sarasota speckled trout fishing tactic is to anchor on the edge of a grass flat that drops off into deeper water. A free lined live shrimp with a small split shot works very well. Again, this can produce a lot of action if a school is found. Silver trout are similar in appearance to speckled trout and are sometimes caught on the deep flats while speckled trout fishing. They do not have spots and can have a purple back. While they look similar, their habits are quite different. Silver trout school up tightly in large numbers. Once located, a bunch of them can be caught in short order. Silver trout are usually caught over sandy bottom in water, between 10′ and 20′ deep. They are often targeted in the Gulf of Mexico, Point of Rocks is a top spot. Jigs bounced on the bottom are very effective, as are live shrimp. Silver trout pull surprisingly hard for their size. There is no size or bag limit on silver trout. They taste great but don’t freeze all that well. The flesh can be a bit soft, so only keep enough for a couple of fresh fish dinners. While speckled trout are outstanding table fare, it is very important to release the larger fish. The current regulations allow anglers to keep four trout between 15″ and 20″ with one over 20″. I strongly encourage the release of fish over 20″. I do not kill them on my trips. These are female breeders that we need to continue the success of the species.